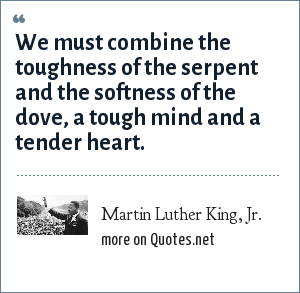 Martin Luther King, Jr.: We must combine the toughness of the serpent and the softness of the dove, a tough mind and a tender heart. "Martin Luther King, Jr. Quotes." Quotes.net. STANDS4 LLC, 2019. Web. 23 Apr. 2019. <https://www.quotes.net/quote/2572>.